Vaccine schedules are important to monitor and maintain if you want to keep your patients healthy and on track. 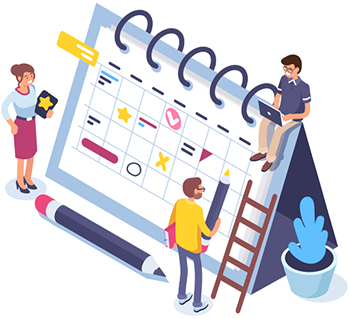 Having a great schedule management tool can play a significant role in how easily your practice is able to manage this important part of its responsibilities. Creating and monitoring vaccine schedules for patients is an incredibly useful feature of schedule management procedures. Although the CDC recommends specific timeframes in which vaccines should ideally be administered, keeping track of all the required vaccinations, when they are next due, and what happens if a timeframe is missed are all tasks that a practice is likely to face during the course of business. If a patient misses an appointment and needs to be placed on an accelerated schedule or an individual is starting a vaccination cycle later than recommended by the CDC, a management tool can be used to determine the appropriate timeframes for future appointments and help your patients get on the right track. Simple and effective tools make all of this easy to track, creating predictive schedules based on when the vaccines were actually administered to greatly ease the scheduling process. A solid scheduling management system will schedule the appointments, record the vaccines used during appointments, and track what will be needed for future appointments. With a tool to integrate inventory management with schedule management, you will have enough vaccinations on hand to meet demand at the right times, helping reduce the likelihood of rescheduling visits and reducing or eliminating waste due to expired or unused vaccines. Effectively and efficiently monitoring your inventory in accordance with your vaccine schedules will allow for reduced costs and more effective vaccine and billing management. Reducing the amount of time spent on these tasks will leave your staff with more time to care for patients.